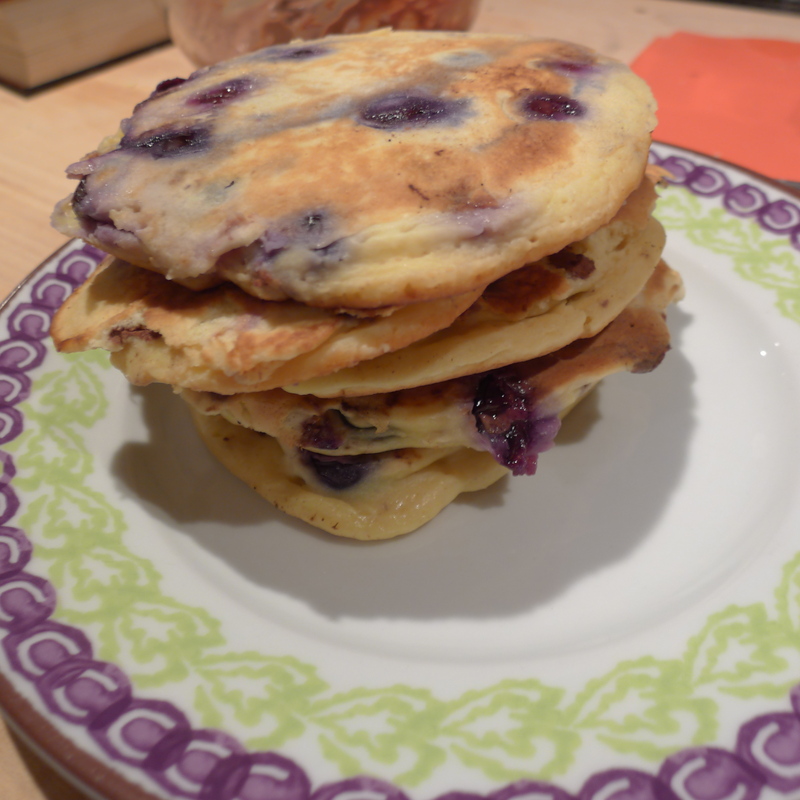 Breakfast: It’s Scandinavian, with Leila Lindholm’s ricotta pancakes (with blueberries). Breakfast and lunch were made last night, because I am just not a good enough mother to be up making a pancake roll packed lunch and blueberry ricotta pancakes in time for a 6.30 breakfast. The pancake rolls will have to be eaten cold, nothing to be done about that, but the fluffy ricotta pancakes were quickly warmed through in the frying pan, with a little butter, and went down very well (they always do). The buckwheat galettes (click here for the recipe) are a long standing family tradition. My family are from Brittany, we still visit as often as we can, and a trip to a créperie (pancake restaurant) is obligatory. Regions in Europe and parts of Asia with areas of poor farming land have a tradition of buckwheat, be it Brittany, Northern Italy, or parts of Russia and Central Europe. Buckwheat isn’t wheat at all, but is related to rhubarb and sorrel, and can grow in poor soil and in climates that would not support true wheat with any real success. It makes darker, nuttier flour, which is not as “strong” as wheat flour, and would not make a good loaf. For pancakes and blinis it is a great success however. Soba noodles are made with it, and some traditional pasta dishes such as pizzoccheri use buckwheat pasta. Breton galettes are always eaten with savoury toppings; they are your main course pancake. Wheat pancakes are for sweet eats. Classic galette toppings are ham, cheese, perhaps soubise (slow cooked onions mixed in béchamel), egg, or simply a little butter. The dream galette (for those without a cholesterol problem) is known as “la compléte”, meaning “the complete”. This is topped with ham, cheese and egg. It is wonderful, if rich. The egg can be “brouillé“ (scrambled, no no no, all wrong) or “miroir” (literally mirror, this is the choice of champions). The trick is to tip the egg into the middle of the galette, so that it gently fries there, with the white cooking through and the yolk remaining an intact mound. 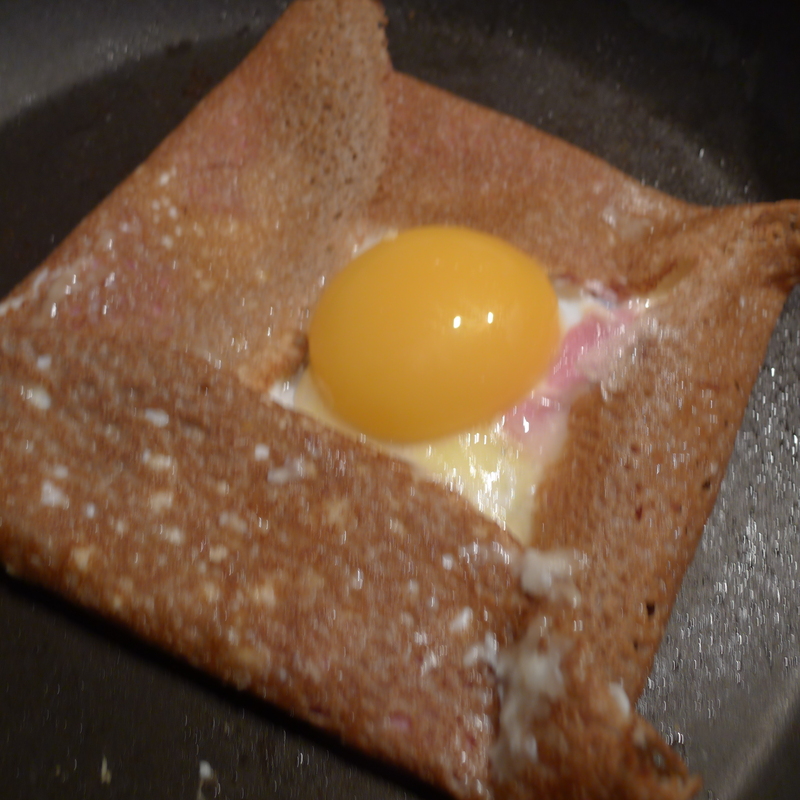 The yolk sits proud in the centre when the sides of the pancake are folded it to contain the rest of the topping, waiting to ooze over the galette like sauce when you cut into it.